Auto- and hard-tuning have long been established practices for vocal production. We test the new VT-4 and discovers our inner Marvin. If there’s one form of music technology almost guaranteed to cause a stir, it’s any effect that can make a human voice sound otherworldly. Vocoders have been successfully doing this for years, but with the advent of hard-tuning in production, the pseudo-vocoded effect has infiltrated many forms of music to become something of a stalwart and a sonic stamp. The new VT-4 from Roland packs a lot into a pint-sized box, measuring a mere 17cm in width. It’s not exactly taking up much room, but don’t be fooled by the bijou form, as it’s very nicely laid out, with sensibly sized pots and faders. Connectivity is pretty substantial. 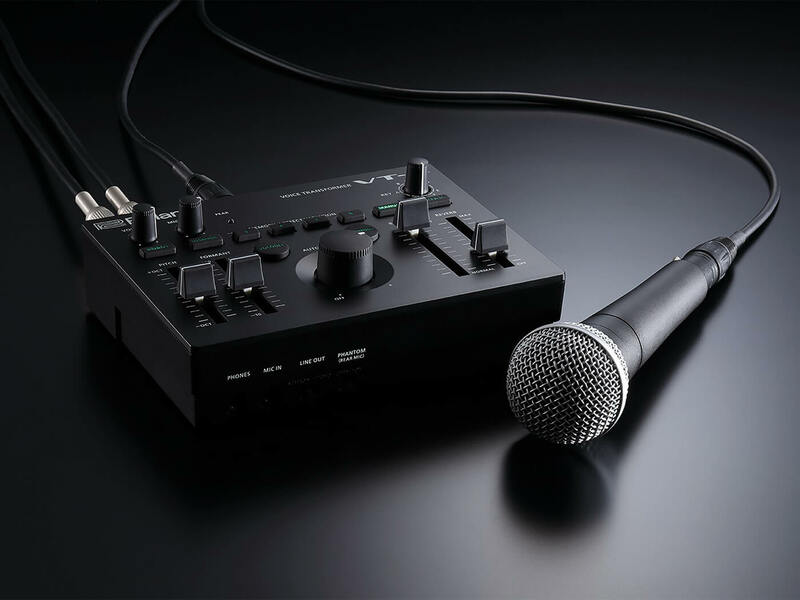 Apart from an obvious mono/stereo output on ¼-inch jacks, there’s MIDI input, mic input on XLR and mini-jack, and USB input, which can provide power while turning the VT-4 into an audio interface – a fantastic trick we have seen with other kindred Roland products. While the VT-4 can also be powered by four AA batteries (which are also included), there’s capacity to power a condenser mic with phantom power. Quite how you can do this from four AA batteries I do not know, but it underlines the VT-4’s clever nature. What the VT-4 sets out to do is provide multiple vocal effects, varying considerably according to the selected element with interplay between each area. Starting with the Robot effect, you’ll unsurprisingly find yourself sounding suitably metallic. Of course, what you think a robot may sound like largely depends on your age and whether you class Alexa as a robot; but for me, it will always be Marvin The Paranoid Android from The Hitchhiker’s Guide To The Galaxy – and the VT-4’s can be confined to a monotone, similar to Marvin’s depressing drone. Yet by exploiting the MIDI connectivity found on the rear of the box, you’ll be able to select the pitch from a MIDI-equipped keyboard. Each of the available vocal effects offers four patches, which are selectable via a multiple button press. One of these patches offers a resemblance to Afrika Bambaataa’s Planet Rock, and it’s impossible to resist trying to sound like all those vocoder-styled records you’ve heard over the years. The next effect in sequence is Megaphone, which is more about heavy EQ. It’s very effective, with plenty of realism, which could be ideal for using live. Anyone who’s tried to use a megaphone into a mic live will know what a Pandora’s box of feedback that can be, so this could prove to be a feedback-avoiding lifesaver. The Vocoder effects offers a slightly more musical take on the previous Robot patches. These sound bright and coherent and, for the most part, are very usable. There’s not a whole lot in the way of control here, so you’re pretty much working with the offered patches, one of which sounds very Roland VP-330-esque, and in its default setting allows for monophonic duties. 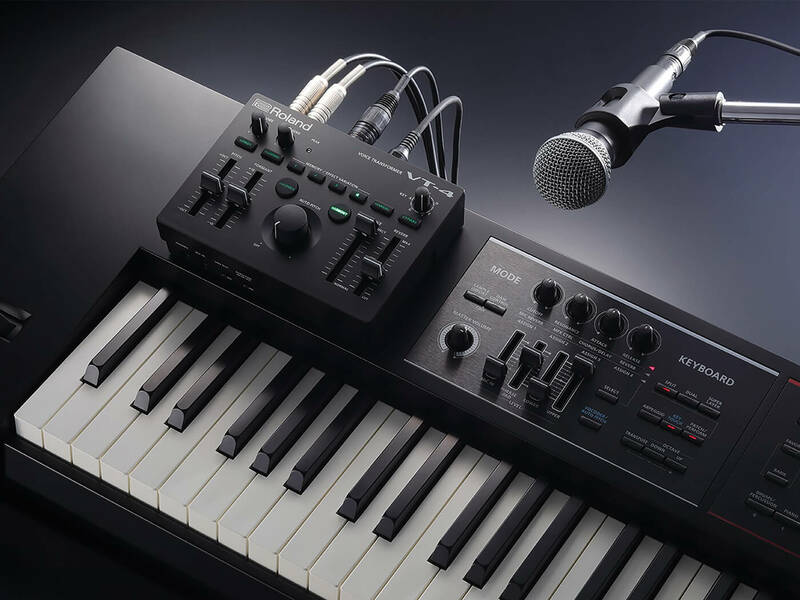 Using a MIDI keyboard allows for control of pitch, but if you don’t feel that this is something you can adequately handle, the inbuilt pitch correction can be deployed to help you out. A very large pot in the centre of the panel will induce the amount of autotune that you might require. This works successfully, while being swift to react to the incoming pitch. Furthermore, the application of the Harmony button alongside it will induce varying degrees of basic chord structure, either side of the incoming pitch, while the Key pot will allow the user to dictate the home key. I’ve always been a vocoder fiend, so it’s not surprising that I prefer to control my carrier signal from the keyboard, but attach this to a DAW and input a vocal track – and it’ll do a very convincing job. I find latency to be very low and workable, while also finding that inputting a drum loop into the mini-jack mic input gives a tight and coherent effect. It’s a shame that there are not more control available. Switching on the VT-4 for the first time and simply plugging in a dynamic mic allows me to just noodle around with the basics, and the front panel impresses. 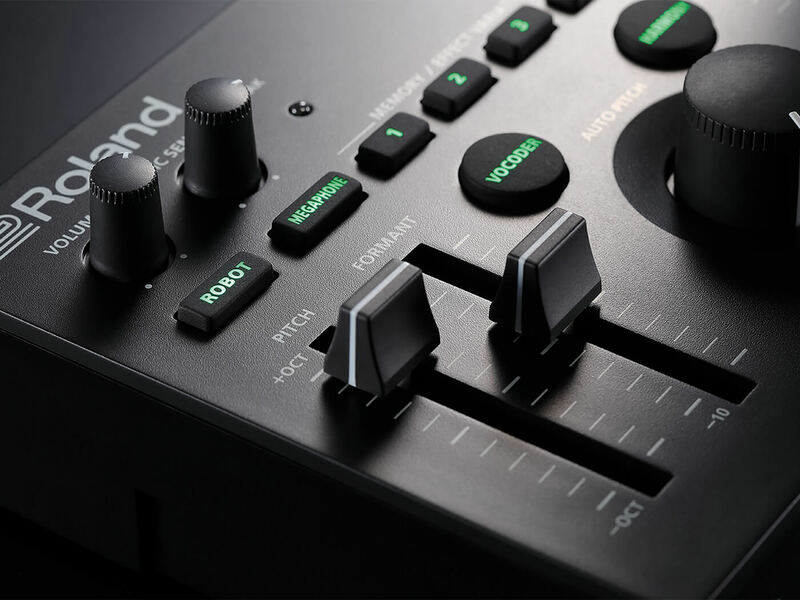 There are four large faders available, which offer a great amount of immediacy. On the left, you have pitch and formant control, which allows me to do my best Beastie Boys impersonation while moving the pitch fader. The Formant control is really helpful for adjusting the tonal construct of the vocal, particularly when you want to work in Harmony mode, where you can make a male vocal sound like there are female BVs behind and, presumably, vice versa. On the right-hand side, two more faders allow for balance of vocal effect as a wet/dry mix, while an additional reverberation fader controls the amount of reverb, echo or delay. There’s not a huge amount of control available in this area either, but they are usable and decent enough, and will prove very helpful for live work. I’m quite impressed by the sheer amount that Roland has managed to squash into this little contraption and I particularly like the general concept that this could be used in a live context, which makes it appealing. It’s a significant upgrade on the VT-3, which for the most part, didn’t offer users what they really wanted, only taking the concept so far. 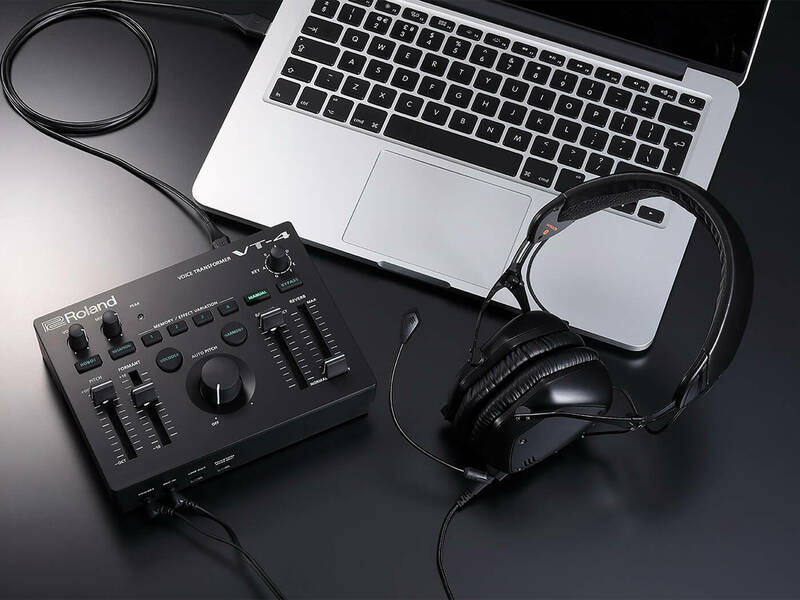 If you factor in the vocoding and robot side with the hard-tune and harmonising side, it’s a multi-purpose unit; with the added bonus of being able to use it as a convincing audio interface. It’s possible to save up to eight Scenes as recallable presets, but there’s not much scope to change the inbuilt nuts and bolts of each sound. However, the basic settings are all accessible, it’s endearing and usable, and it could prove to be very useful, especially if you find yourself needing these effects live. The MIDI keyboard control also opens use up to players who might like to use it as a pretty convincing little vocoder. Clearly, the VT-4 is designed to mostly operate on vocals, although it proved useful when using other signals such as drums as a modulating signal. But if you have need for creating interesting and unusual vocal sounds, or sounds which are stylised toward the hard-tuned colours of R ’n’ B, this could be a useful purchase. It’s purposely multifaceted, offering vocoding, megaphones, robots and harmonising and would be good for anyone requiring these sorts of effects live, or who might like working on-the-fly while studio-bound. It’s a box with a decent build quality, which is stacked full of useful and interesting vocal-based options. If you know you like vocoding and effects of this kind, the MIDI- and pitch-controllable content will be an immediate hit, particularly at this price point. 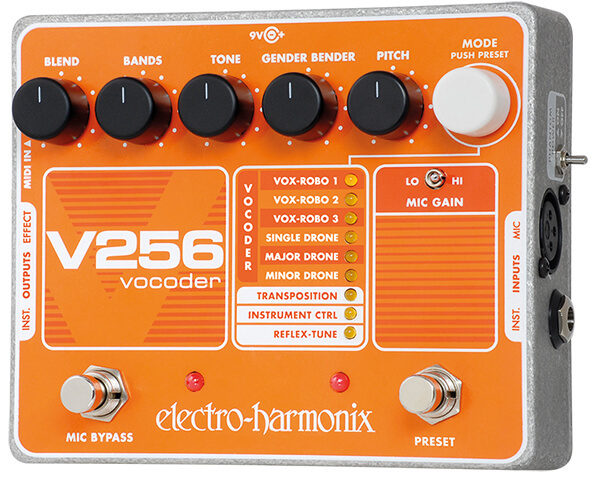 Although not a vocoder, this will offer hard-tune vocal FX, harmonisation and effects in an easy to use box. It is geared more toward guitarists, but don’t let that fool you into thinking that it’s not great in the studio. Although another stompbox, this offers hard-tune vocals alongside an admirable vocoder, controllable via pitch and MIDI. The vocoder makes an exceptionally smooth sound and has a useful drone function.